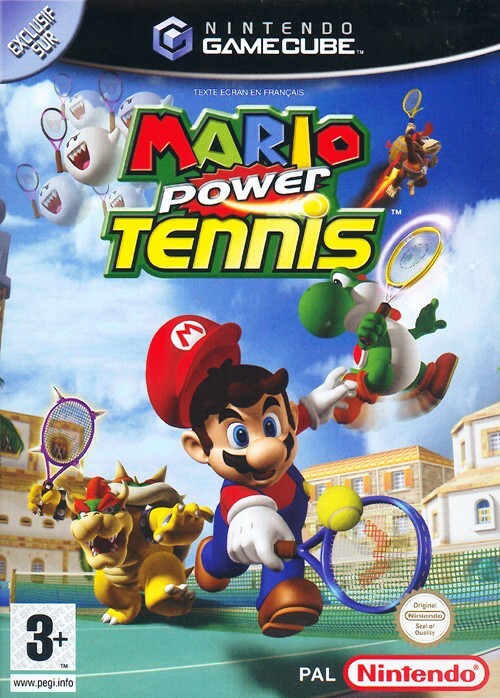 Mario Power Tennis on the Gamecube is a tennis game played with Mario characters. This game is one hundred percent Mario, and one hundred percent tennis. There is an amazing intro movie, that is just stunning to behold. The game ending is hilarious out takes from the intro movie. Singles, and doubles play are both well represented. There is also an amazing amount of players, mini games, and tournaments to unlock. In addition to all those, the game gives you gimmick modes which will challenge the best tennis player. How does this Game Play? Exceptional. Different characters have different speeds, so playing a different character can take some getting used to. Power hits, and power saves both work extremely well. In fact the computer will frustrate you with their power saves after you burned it by them. Moving your character around the tennis court performs just as you would expect it to. Angling your shot to different sides of the court works perfectly with the Gamecube controller. How engaging is the story? A Mario game based on tennis would seem like something that would have no story whatsoever. Imagine this reviewers surprise that each different character has a different game ending movie. These movies tell a story about each character, and how they inter-related to one another. Beating the game with each different character is highly desirable. Ultimately since it generated interest, and was exciting, I would have to say the story was very engaging. Sweet! The graphics are very nicely done in both the movies, and the regular game play. When power hits are performed there is so much happening on the screen, at times the ball can be lost. Players can stand mere feet from each other across the net, and volley it back and forth. The game keeps up with all this. The sounds are nicely done. The music is also done nicely. The music has a distinctive Mario theme. Certain mini games have music and sounds related to that area. For example the Donkey Kong jungle. Sports games are generally more appropriate for Christians. Mario Power Tennis is no exception. The only violence is hitting someone with a tennis ball, which honestly can happen in real tennis. There is one court with Luigi?s Haunted mansion in the background, and a mini game with ghosts in it. Both of those are cartoon like, and can be avoided. Power hits, and power saves are all classic Mario. For example Mario?s power hit uses a hammer to hit the ball, the ball turns into a flaming fireball. Mario?s power save is he spins around to the ball, and then hits it. The game is competitive, so the only warning I really give is it may make you angry if losing bothers you. I had a blast with this game. At first the game is easy, and beating the tournaments is a breeze. Later on, the tournaments taught me a lot of humility. Bear in mind talking smack to a game like this in the beginning will only make you eat your words later on. Singles play requires different strategy from doubles play. Along with all the different characters, mini games, gimmick courses, etc. there is a ton of replay here. Almost forgot you can play with family/friends as well. God bless you, and thank you for taking the time to read my opinions.